Home Dr M weekend plant mini-quiz Dr M’s mini-quiz answer #2: the monocot which breaks the rules! Dr M’s mini-quiz answer #2: the monocot which breaks the rules! So #2 in Dr M’s weekend mystery plant mini-quiz was a grass-like plant for sure, but without one of the defining feature of the family, a ligule! Check the images here if you want to remind yourself. A grass without a ligule is that possible? Is it really a grass? Yes it is possible (though uncommon), and yes it is a grass! And from the featured image above you can see the inflorescence is a branched panicle of several spike-like dense green or purplish racemes and the spikelets have awns, so it ticks most, if not quite all, the features of the family Poaceae. 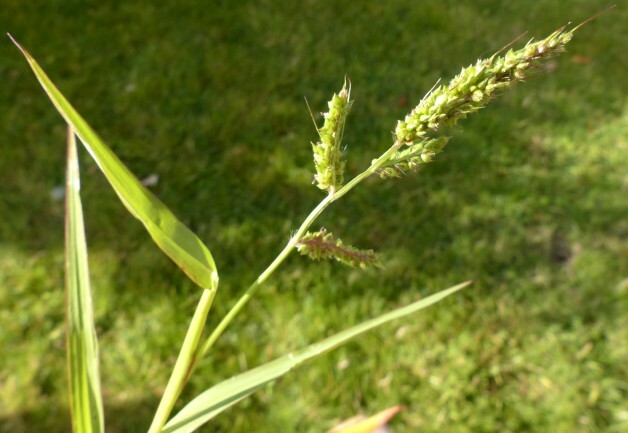 Actually this grass is in the tribe Paniceae, alongside Panicum (Millet) and Setaria (the Bristle Grasses) but the absence of a ligule is uncommon even in this tribe and most grasses in the Paniceae have ligules. This makes the absence of the ligule highly diagnostic and if, for example, you Google “grass with no ligule” or “grass without ligule” you will probably find this plant (Google images should reveal it). But you will also find a lot of grasses WITH ligules, Google has a way to go before it hits top of the botanical class, but it’s getting there, maybe Google should attend one of Dr M’s field botany classes soon! So let’s cut to the chase, the mystery grass is Echinochloa crusgalli (Cockspur) which in the UK is classed as a neophyte, meaning it is not native but introduced by people relatively recently, probably around the 17th century, and it is a native of warmer climates in the warm temperate and tropical regions of the world. In fact the tribe Paniceae includes mostly tropical species and there are no native members of the Paniceae in the UK, though a number are introduced weeds, or grown as crops or as ornamentals. Cockspur is a coarse annual with no ligule (as we know!) and with broad, keeled leaf blades and an untidy crowded inflorescence, often tinged purple, and with awned spikelets. In the UK it grows mainly in the warmer areas in southern England and the Channel Islands and populations persist due to high seed production, efficient dispersal and presence of dormant seed. Do you think Francis Rose’s book is the most user friendly book on grass id, or is there a better one? Thanks!